When lunch time rolls around for Mike Schneider, he doesn't sit eating in the conference room. No, he heads out to walk along the beach, near Sandpoint Rd. 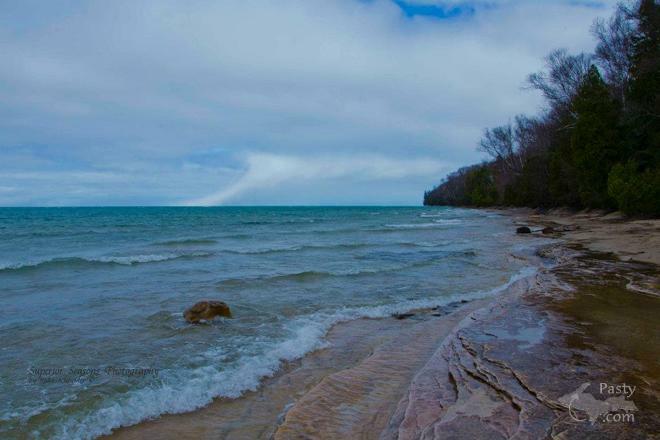 at the Pictured Rocks National Lakeshore. 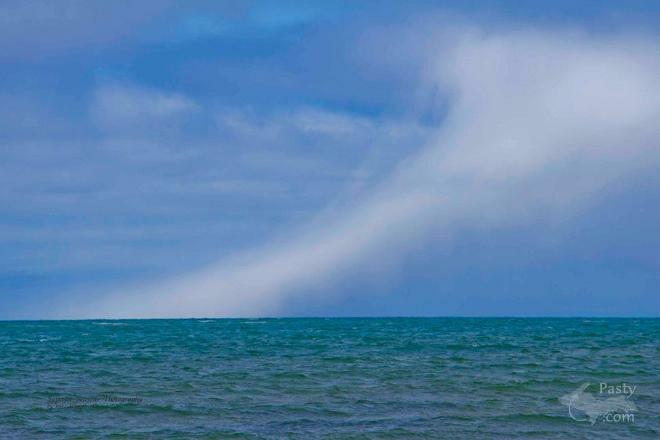 That's just what he was doing last week one day, when he spotted a different sort of cloud out over Lake Superior. It seemed to be reaching out from the sky to touch the water. Quite an unusual cloud formation at that. Maybe we'll be lucky and have one of our cloud buffs, fill us in on what type of cumulus this could be. In the meantime, back to Mike and his lunch walk near Munising...he told me this, about spending it on the shores of Gitche Gumee: "Each day there has been so very different, very warm one day and then just freezing with the wind the next, but the birds are always singing and everything is getting green!" Incredible pictures today! How blue the water is! <!-NOTE: Message edited by 'frnash'-!> I don't think that's a waterspout � there's definitely no cloud rotation present, as there would be in a waterspout. 'Tis more likely a small rain shower, from a faster moving cloud above, that's being dragged along the lake due to friction and surface tension. Neat pictures! Steamed? � Sounds very much like the old White Castle, founded in 1921; except that any condiments, such as ketchup or mustard, were to be added by the customer at White Castle. There was a White Castle about a half-mile from where I lived in Detroit, at McNichols (Six Mile) and Woodward. Now there is one a half-mile from where I live in Troy, MI. Sdcferndale; I remember the old white castle bldg. before they built the new one. It was a lot smaller then the new ones are. I use to work at that one, (8 and woodward) longggggg time ago. The Original Marcus is still at McNichols and Mt. Elliot. The burgers are made in a pan covered with water which eventially turns to gravy. Basically they are cooked in their own juices. A bowl of relish, a bowl of onions and mustard is put on the U-shaped counter.